This week’s muse holds a special place in our hearts here at Ceci New York: It’s Candace, our irreplaceable sales director! I couldn’t be prouder to feature Candace’s wedding. Not only is she an integral part of the company, but my creative team and I had a blast designing her invitations. We wanted them to be a reflection of her love of bling, flourishes, and flowers - but pulled together in an elegant way. So we went above and beyond by featuring some of our favorite details, including letterpress printing, decorative bellybands, and die-cut envelopes that we lined in a gorgeous floral pattern. When you work in the wedding business and live in New York like Candace does, you have the distinct advantage of being able to make your event the best it can be. Candace and Chris held their dazzling party at the Lighthouse at Chelsea Piers, with its fantastic views of the Hudson River. But probably my favorite detail was the photo booth that guests used to document the night. 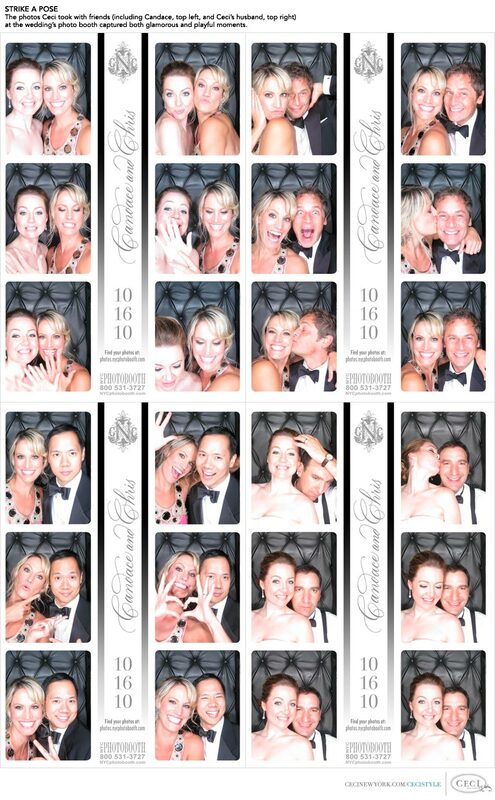 I love that the photo booth company was able to incorporate the brand I made for the couple on the photo strips, which you’ll see in the collage below (as you can tell, we all had fun shining in the spotlight!). Best of all, guests were instructed to keep half of the pictures and put the rest in the couples’ guest book with a message. Such a fun keepsake for everyone! For those who share Candace’s love of sparkly, big-night glamour, this week’s Get the Look has a mix of great looks for your next party. Also, don’t miss the tips I’ve gathered from caterer Abigail Kirsch, hair stylist DM, and floral designer Bardin Palomo. Now it’s your turn to shine!